I’ve become a huge fan of Sun Warrior Protein powder and I’m happy that my hubby has too, I make a double smoothie for both of us on week mornings so he has a quick breakfast to take to work. But that also means we’re going through it twice as fast now and it’s not cheap when buying a bag every three weeks or so. I’m on a mission to save money this year, not easy with all the rising costs! But I found something new to try at Sprouts Farmer’s Market today – Olympian Labs Vanilla Pea Protein. For the same size jug as Sun Warrior, it costs about 40% less and flavored nicely with vanilla and stevia. 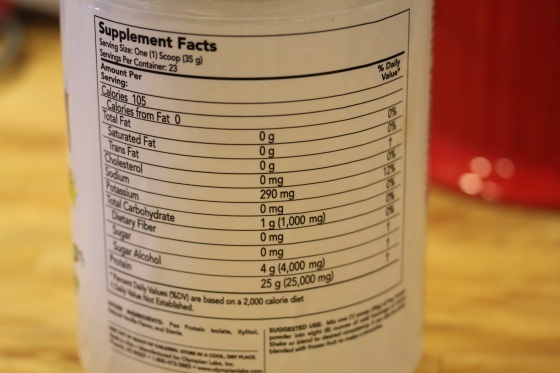 And it has 9 more grams of protein per serving for a hefty 25 grams per scoop. It seems to blend just as smoothly into smoothies and has a slightly sweet and mild flavor that digests easier and is not gritty or grainy like hemp protein powder can be. For more information on vegan protein powders, Gena did a great post on them here. 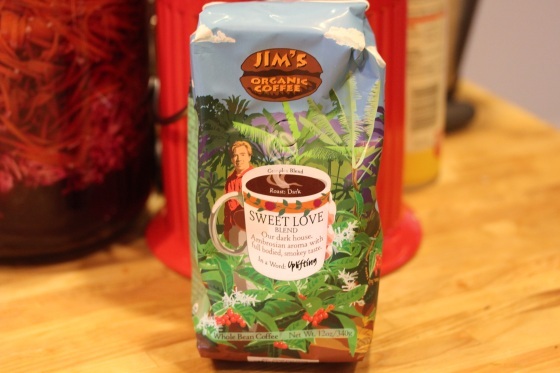 While at Sprouts, I also grabbed a new coffee to try that wasn’t too pricey, Jim’s Organic Coffee. I’m not a huge coffee drinker, I only have about two cups in the morning and no more caffeine for rest of the day since I seem to be hyper sensitive to it. But I like the freshly ground whole bean stuff, poor hubby gets to hear the coffee grinder very early every morning before he’s even out of bed! 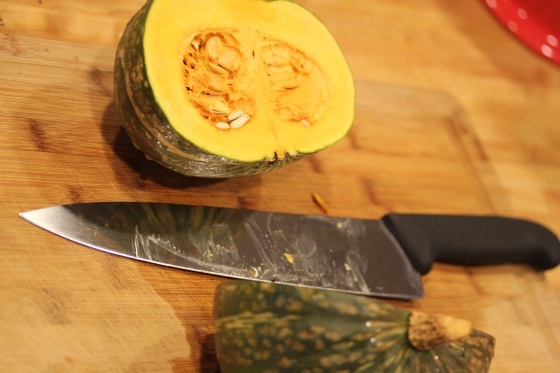 Chopping through kabochas is not so fun because they’re very tough and dense, my Victorinox 10″ chef’s knife is perfect for this with plenty of leverage room on the blade to push down on either side and rock the blade through … while not chopping off a finger. 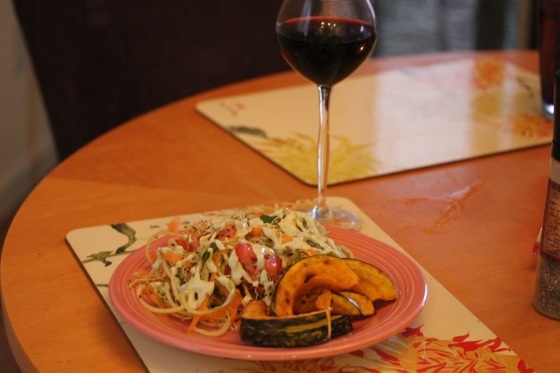 I chopped the seeded squash into wedges and tossed with a little coconut oil and salt. 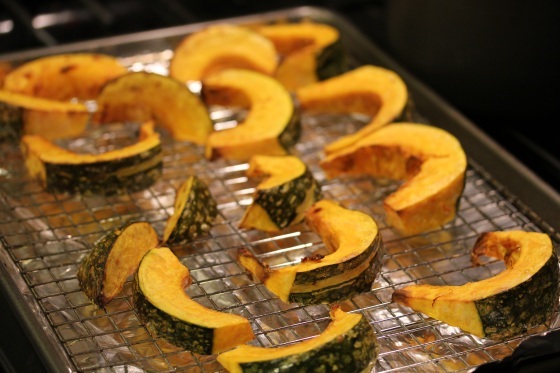 Then baked at 350 degrees for 40 minutes. They wedges came out perfectly, hot and gooey in the center with crispy edges. 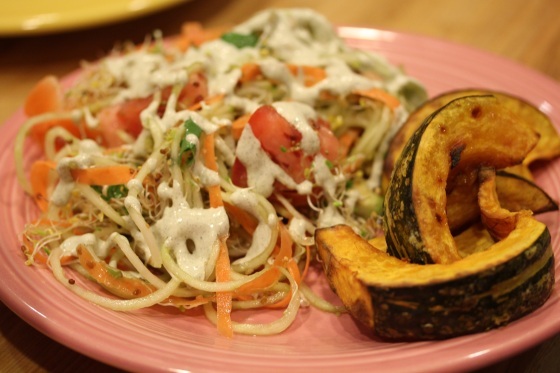 I served the wedges with a salad of spiralized cucumber, sprouts, carrots, tomatoes and a hemp seed-based ranch dressing I whipped up in the Vita-Mix. Now I’m a little sad that the weekend is nearly over, wasn’t it just Friday? Especially since I’m looking at another busy week at work being on call, training more and adjusting to staffing changes – ugh. I will probably need serious motivation to survive this week I can already tell. I wish I could be one of those who wakes up on Monday and embraces the week ahead ready to take on all the challenges happily. And sometimes I am that person. But not now after such a bad week last week and not knowing when things will be lightening up a bit. How do you motivate yourself through tough weeks? Hang in there, this will be a good week ! It’s hard to have a positive mental attitude sometimes, but I try and think just about the day (or even hour) ahead and not dwell on what else might be coming my way at work. 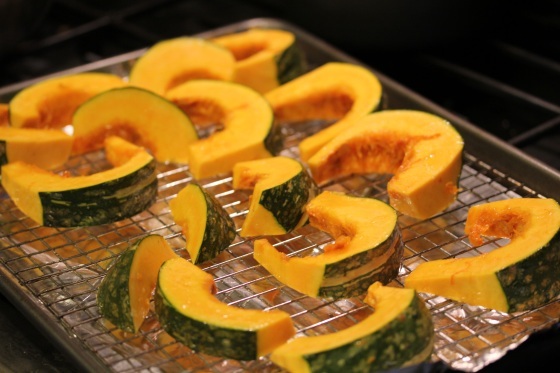 the squash wedges look perfect and i too worry bout hacking off a finger when chopping squash! 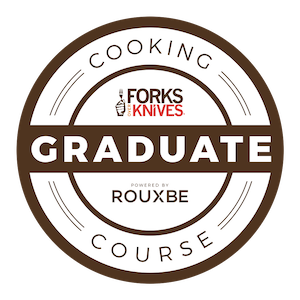 your knife, thanks for always reminding me about that brand! 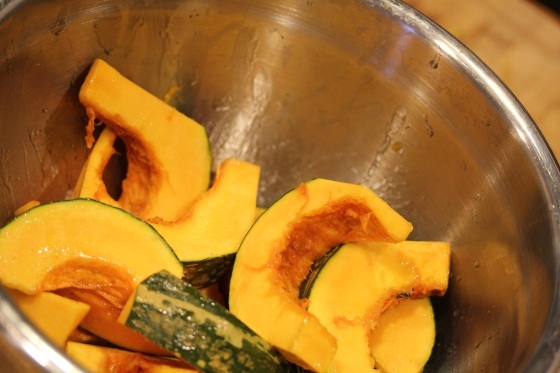 “hot and gooey in the center with crispy edges.” = Nice. That’s the best. Pea protein. Very scared it would taste like dirt. I cannot stand most proteins bc they are so earthy, gritty, “dirty” tasting but i trust your opinion and will look into it if you say it’s not that way! I think you’ll like this pea protein, it has a very sweet vanilla flavor and I like that it packs more protein than Sun Warrior. I could easily see using it in banana soft serve and protein popcorn. Agreed on some proteins being too earthy, that’s my issue with hemp protein. 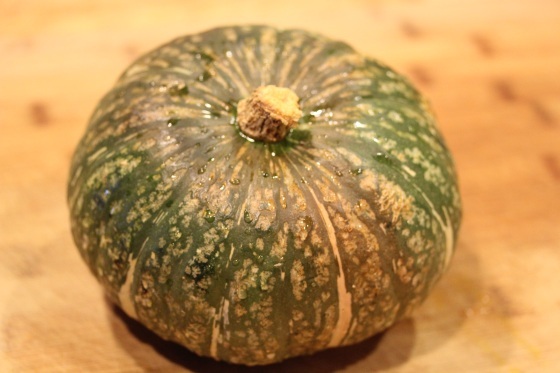 There is NOTHING like baked kabocha! So satisfying and delicious. 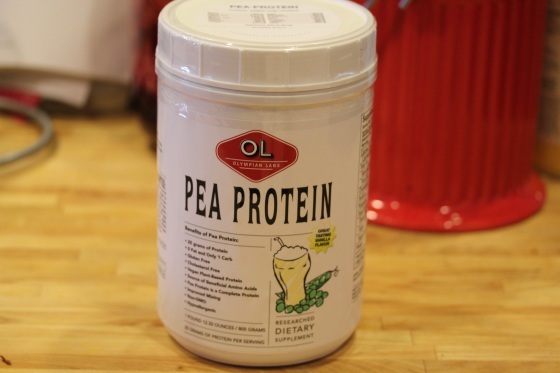 Great tips on the pea protein. I’ve never had it alone — just in Vega — so curious to try. I haven’t tried Sun Warrior because of the $$$ price tag. How great that you found a cheaper alternative! Very interesting about the protein powder! I buy sunwarrior religiously, and have the same issue with joe now using it (although I’m thrilled…the downside is definitely the increased rate of consumption!). Thanks for the recommendation on the Olympia…I don’t know why I stick with sunwarrior when there are cheaper versions. I think they must be just as good right?! I honestly think the flavor and texture to this pea protein is very close to Sun Warrior and $25 on Amazon is a lot cheaper than $47 for Sun Warrior. Plus I like that pea protein has more protein per serving. oh man, i am dealing with the same feelings as you as far as work goes this week. i’m trying to stay motivated too so i can’t wait to see what people have to say; i need ideas too! and i need to find that pea powder…since i don’t want to fork out the cost for my vega chocolate protein powder…haha. Vega products are super pricey, I used the Whole Health Optimizer while training for the half and ouch, I couldn’t afford that regularly!